Donald Trump's legal challenge to a planned offshore wind farm has been rejected by the UK's Supreme Court. 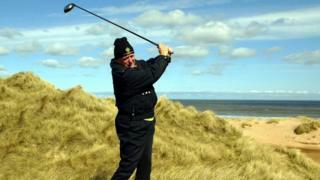 Developers hope to site 11 turbines off Aberdeen, close to Mr Trump's golfing development on the Aberdeenshire coast. The US businessman and presidential hopeful was taking on the Scottish government, which approved the plan. The Trump Organisation said it was an "extremely unfortunate" ruling and it would "continue to fight" the wind farm proposal. Former First Minister Alex Salmond said the latest court verdict left Mr Trump a "three-time loser". The Trump Organisation responded: "Does anyone care what this man thinks? He's a has-been and totally irrelevant." Mr Trump began his challenge to the decision to grant planning permission more than two years ago. He was furious when the Scottish government approved plans for the renewable energy development within sight of his multi-million pound golf development on the Menie estate, north of Aberdeen. He said the turbines would spoil the view. Mr Trump made a series of legal challenges in the Scottish courts and then took the fight to the UK's Supreme Court in London. He argued that planning consent for the wind farm was so imprecise as to make it legally invalid. The Supreme Court judges delivered a unanimous ruling. The Trump Organisation said: "This is an extremely unfortunate verdict for the residents of Aberdeen and anyone who cares about Scotland's economic future. "The EOWDC (European Offshore Wind Deployment Centre) will completely destroy the bucolic Aberdeen Bay and cast a terrible shadow upon the future of tourism for the area. "History will judge those involved unfavourably and the outcome demonstrates the foolish, small-minded and parochial mentality which dominates the current Scottish government's dangerous experiment with wind energy. "We will evaluate the court's decision and continue to fight this proposal on every possible front." Andy Paine, project director for Aberdeen Offshore Wind Farm Ltd, said: "This is another significant step forward for the EOWDC. "It affirms the scheme's potential to position Scotland, and particularly the north east, as a centre of innovative offshore wind power." Energy Minister Fergus Ewing said: "I am pleased that the Supreme Court has unanimously found in our favour. "The proposed European Offshore Wind Deployment Centre is an important project for Aberdeen and north east Scotland. "It will give the industry the ability to test and demonstrate new technologies to enable costs to be further reduced. "Aberdeen is already of global importance for hydrocarbons and this wind deployment centre cements its role in renewable offshore development, further positioning Aberdeen as the energy capital of Europe and a world energy centre." SNP MP and MSP Mr Salmond, who led the Scottish government until a year ago, said: "As first minister, I was cited in Trump's legal action. Now that it is concluded, I am free to speak my mind on the damaging impact of his interventions on the Scottish economy. "These proceedings have been dragged out for years through three successive court judgements by Donald Trump as he tried to stop an offshore Aberdeen wind turbine demonstrator by means of legal action. "In doing so he has at best postponed, and at worst jeopardised, a vital £200m boost for the economy of the north east of Scotland. "The offshore project could have been built by now with Aberdeen benefiting from becoming the offshore wind research centre of Europe - a vital development at a time of rock bottom oil prices." WWF Scotland director Lang Banks said: "This result is great news for Scotland and for all those interested in tackling climate change and creating jobs. "Having failed in his attempt to undermine Scotland's renewables ambitions, it's now time for Mr Trump to move on." Details are emerging from the mammoth 448-page report which investigated alleged Russia collusion.